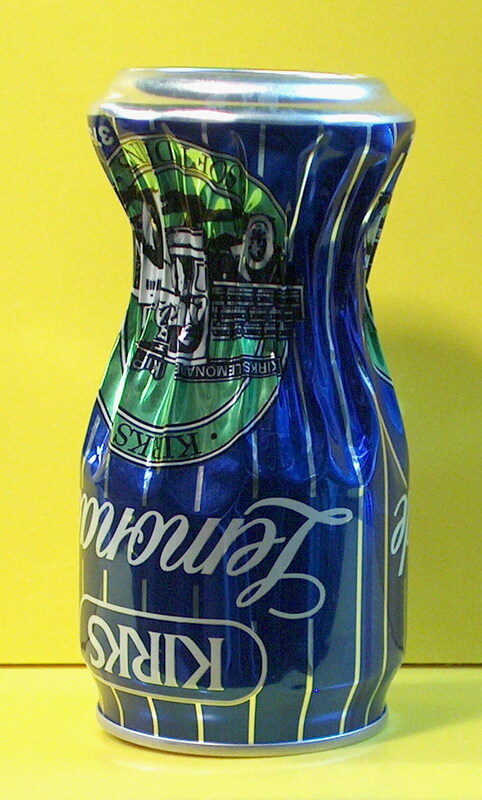 Can crushing This is done by discharging a capacitor through a coil wrapped around an aluminium drink can. 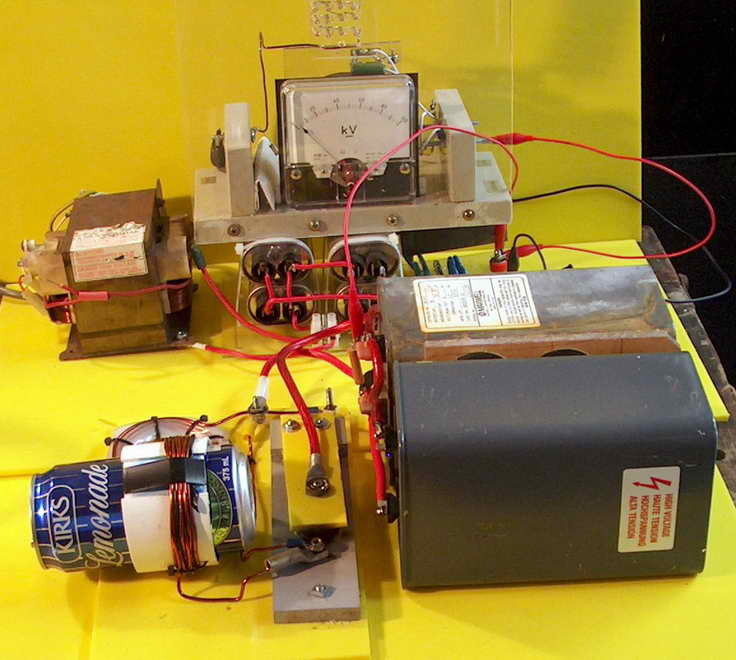 The high voltage capacitor is necessary to generate very high peak currents to induce currents in the can which magnetically heat and crush it. Both capacitors come from medical defibrillators. These normally deliver up to 360 joules into the chest body resistance between large conductive pads of around 50 - 100 ohms (modern machines print this out with each shock). There is a series coil of around 47 mH to limit peak current flow in the medical situation. Both capacitors are Maxwell pulse rated around 36 uF at 5.2 kV and each stores 500 J (total 1000 joules). 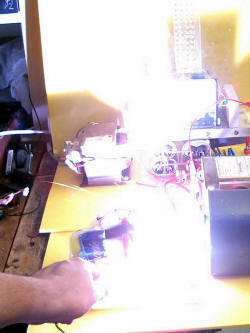 I charge it with the supply I made for HeNe lasers. The coil is made from 8 turns of 2 mm wire. Most can crushers only use a few turns. I have not tried this before as I believed that I did not have enough power for to crush a can. Interestingly my 800 V supply with SCR switching barely makes a dent in the can although the delivered energy of 1500 joules is greater. A rapid rise time is important. 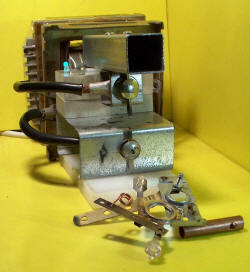 I trigger it by a momentary switch (the grey and yellow plastic device above) with large metal contacts. Not really cool like a triggered spark gap. On one occasion the can shorted the coil and I could feel the blast wave from the spark. I wear hearing and eye protection and look away (while firing and taking the picture)! Larger can crushers will tear the can in half with around 2000 joules. Low voltage (but high current) One volt can be impressive too. 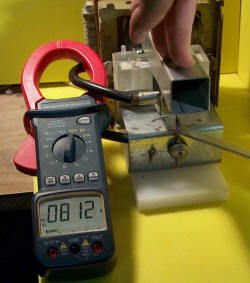 Check out the 533 A current on the clamp meter from this transformer (above). The secondary is wound with 12 mm by 3 mm rectangular wire and is rated at 6 V 90 amps. Seen here heating an iron strip from a transformer lamination with about 1.1 volts across the two bolts = 600 W. At this current it will melt if left on for more than a few seconds for the picture. Short circuit current is around 830 A plus. This was another of my junkyard cheapo transformers for around AUD$20. Spotwelder I made this as I thought I may need something to make joins use in a vacuum that may get red hot. Epoxy and plain or silver soldering would not do. It uses the transformer above and is able to spot weld a variety of mostly thin metal sheets. The left photo shows the hinged arm which allows two tungsten electrodes to come together. I also shows various bits of metal joined with this (very 'art nouveau'). The middle photo shows the flash if there is a poor contact. The right photo shows a good contact and 812 amps flowing. About 1-2 seconds later the tungsten rod was red hot. The 8 mm black cables get hot even with a few shots. 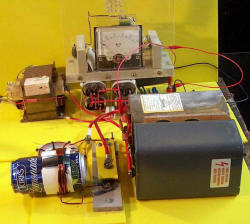 My sentimental favourite power supply was made in 1971 and was developed over the years. It appeared in the local newspapers 8 times as a backdrop to photos about two of four state wide talent quest prizes I won between 1970 and 1973. Currently (no pun intended) it is defunct but previously supplied 1-30 V DC at 1 A with a LM317 regulator, and a range of AC voltages from 3 V to 500 V.
Here is what happens when you put a few kV between two nails in some wet pine. 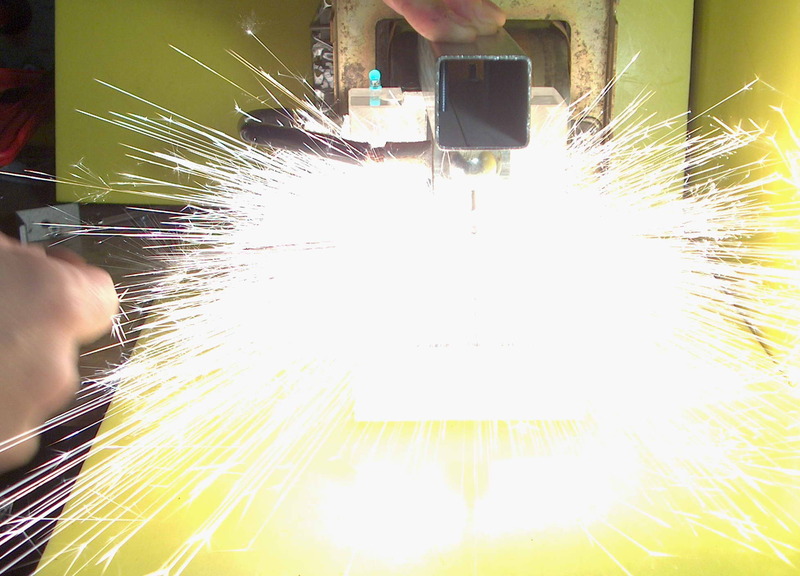 I have adjusted the voltage between 2 to 10 kV from my single MOT with voltage multiplier as used in my laser supply altering it periodically to promote the spark or prevent flames. If things stopped I added a water spray. They burns have a curiously fractal nature about them. Note that the burns are just as likely to burn away from the nails as towards. I didn't encourage things either way.